QUEENS — A lawyer and his husband were removed from a JetBlue flight to San Francisco Thursday morning after harassing President-elect Donald Trump’s daughter Ivanka and her family as the plane was preparing for takeoff at JFK Airport, officials said. 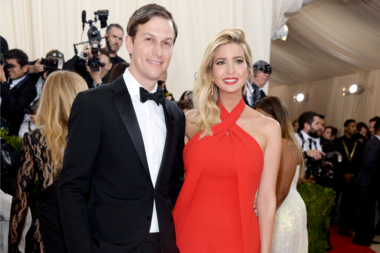 Passenger Daniel Goldstein started to shout at Trump, who was sitting with her husband, Jared Kushner, and their three children, sources said. Goldstein said her father, Donald, “was ruining the country,” according to a tweet from Goldstein's husband, Hunter College associate professor Matthew Lasner. The tweet was subsequently taken down after JetBlue security stepped in and escorted the anti-Trump duo off the plane and placed them on the next flight. Lasner later tweeted that Goldstein approached the family and "expressed displeasure in a calm tone," according to reports. "The decision to remove a customer from a flight is not taken lightly," JetBlue said in a statement. "If the crew determines that a customer is causing conflict on the aircraft, the customer will be asked to deplane, especially if the crew feels the situation runs the risk of escalation during flight. In this instance, our team worked to re-accommodate the party on the next available flight." TMZ, which was the first to report the incident, said Goldstein demanded to know why Ivanka Trump was on a commercial flight instead of flying on a private jet. Ivanka Trump tried to ignore the rants and keep her children distracted with crayon drawing, TMZ said.